The different marketing priorities of Amstrad and Sinclair Research were very apparent in the release of Amstrad's first peripheral for the Spectrum, the SJS1 (aka Sinclair Joystick System). Joysticks were, of course, two a penny by the time the SJS1 was released but it was a market which Sinclair had never touched, despite the fact that it would have made a considerable amount of money if it had. Judging from Sir Clive Sinclair's utopian pronouncements of the time about computing ushering in a new Athenian Golden Age, he probably felt that a joystick was too frivolous a product to bother with. In sharp contrast, every one of Amstrad's peripherals was games-related. 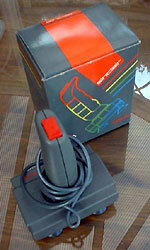 The SJS1 was a wholly unremarkable digital joystick mass-produced in the Far East. It was not highly regarded: CRASH magazine probably spoke for many when it called the joystick "one of those appalling joysticks which you're much better off leaving in the box". It could be bought separately for £14.95 and was included in several different Spectrum +2 and +3 bundles. The joystick ports on both machines were compatible only with the unpopular joystick standard established by Sinclair Research, but wily third-party manufacturers soon began shipping conversion devices permitting the use of better-quality Kempston-standard joysticks.